The flowers are gone from the garden, except a few blooms of the last to bloom ex-asters, one or two tiny fleabanes hidden beneath fallen leaves, a Blanketflower and Verbesina virginica's marvelous and magical frost flowers. I never tire of seeing the frost flowers blooming in my garden. All it takes is a warm winter day followed by a cold winter night. During the day, Verbesina virginica's roots draw water up into the stem and later that night freezing temperatures force the sap from the stems where they freeze into sculptural ice candy flower curls. I love finding them on an early morning walk, they remind me that magic is still happening and that the garden is just resting. In the mid-south the garden and gardener rest for a short time. Dreaming and planning don't stop. I walk the leaf covered paths and assess what worked and didn't. 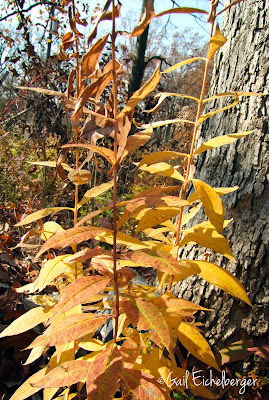 I notice that the Hypericum frondosum is moving toward its hyper-colored late fall look and that something has been snacking on its leaves. The Illicium parviflorum 'Florida Sunshine' that I've been trialing is doing okay despite a very dry summer. I like it enough that I added two more. They look good massed but, I am using them as specimen plants. This is a very green garden in mid summer and needs color where ever I can add it. The Oakleaf hydrangeas are still brilliantly colored and their seeds heads are gorgeous. The seedheads will stay put until late winter. I am so glad they're a part of the shrub layer in this garden, they add drama, color and texture. I noticed the native annuals and biennials have germinated. I've two annual natives that I am crazy about. Astranthium integrifolium/Entireleaf Western Daisy which I found naturally growing in the weedy back lawn almost 30 years ago and Collinsia verna/Blue-eyed Mary, which I added many years ago. They've both made a home for themselves in the shade of the taller rough and tumble wildflowers in the sunny Susans bed and as long as they are always allowed to go to seed they will thrive. One little plant can make a dozen offspring before you know it. I hope you're fortunate enough to have a biennial like Phacelia bipinnatifida. The second year Phacelia rosettes are everywhere and that means early next spring will be dressed in gorgeous purple flowers covered with Mason bees. When I added Phacelia to the garden I was lucky enough to have first and second year rosettes. I've had blooms every year since. 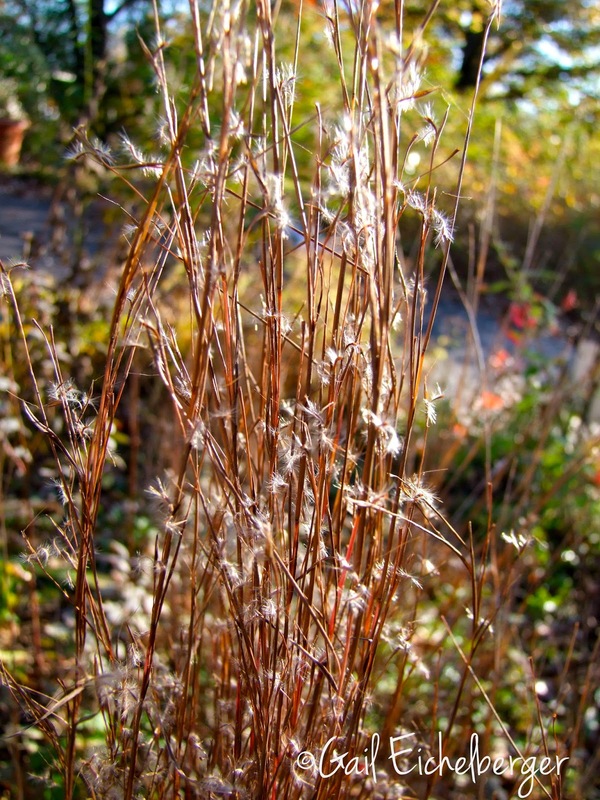 Biennials are adept self-seeders and can be in your garden forever if you let them be! 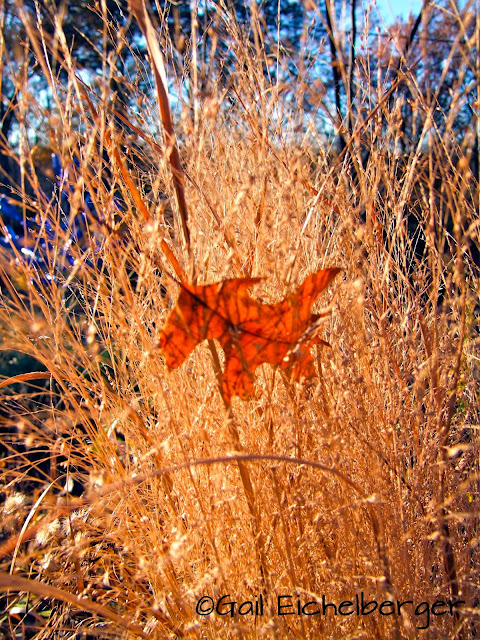 The garden is a sea of browning leaves and seedheads. I think they're beautiful. The promise of spring is in every one of those seeds. It's everywhere if you look carefully. 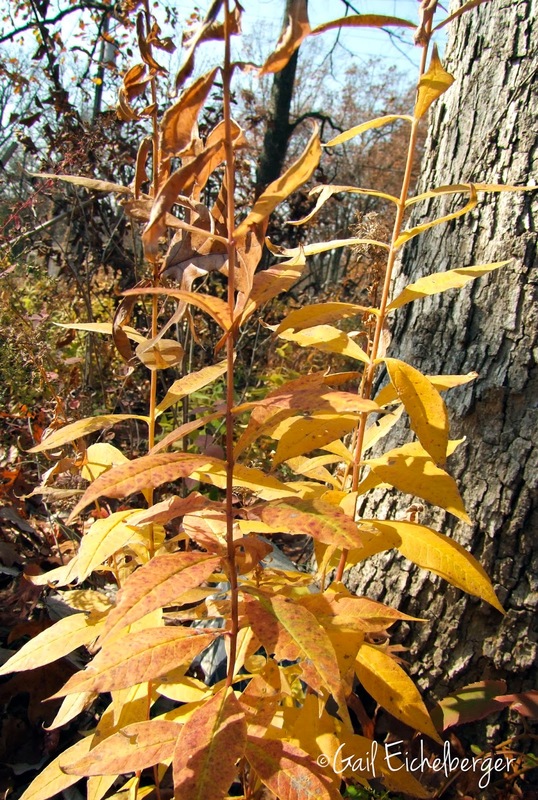 Take a close look at your native shrubs. Dogwoods and Viburnums show their flower buds at the tips of their stems and the buds of late winter blooming witch hazels and spring blooming Spicebush line the stems. Under my feet and hiding in the leaves are the acorns that keep the squirrels and chipmunks busy. I wonder when the deer will stop by to get their favorite bur oak acorns and I remembered to pick up a few to send to an OKC friend who wants to grow them in his garden. It will be beautiful by his lake! The panicum and phlox cultivars that I planted this summer were delightful. More will be added...That means plants like Verbena hastata that need wetter soil might need to be moved to a container near a faucet. They're too pretty to not have in the garden, but, they just aren't happy in the shallow soil. This year after irregular rains that verged on a drought, I am especially thankful for my rough and tumble take care of themselves wildflower beauties~Thank you Rudbeckia, Coreopsis, Pycnanthemum, Phlox, Penstemon, Eutrochium, and grasses, Danthonia spicata, Panicum virgatum and Schizachyrium scoparium~You make it worthwhile to garden with difficult conditions. I am thankful for wildflowers. They have brought me so much joy. When I stop and think about it I have wildflowers to thank for helping me gain new knowledge, for great adventures and for meeting new people. Without wildflowers I wouldn't have met my first garden mentor, Paul Moore. I wouldn't know Mike Berkley and Terri Barnes of GroWild. Without wildflowers I might not have been drawn to the Tennessee Naturalist Program or volunteered at Owl's Hill. 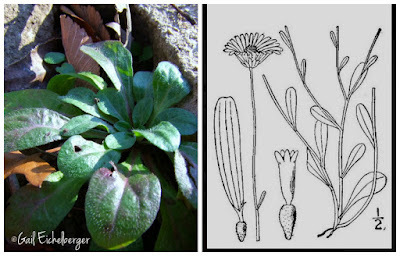 Wildflowers led me to blogging and searching the internet to learn all I could about native plants. That's when I stumbled upon Pam Penick's blog Digging and read about Garden Bloggers Fling. I've gone to many Flings and met bloggers who have become some of my dearest friends~I cannot mention everyone for fear I will forget some. I count myself fortunate indeed to have made friends with folks from all over this country, Canada and the UK....Some of them are even as wild about wildflowers as I am. My love for wildflowers opened my eyes to pollinators and their importance to our gardens, to agriculture and to the earth. I came to love wildflowers so much that I wanted others to appreciate them. That's why I started the Wildflower Wednesday monthly meme. 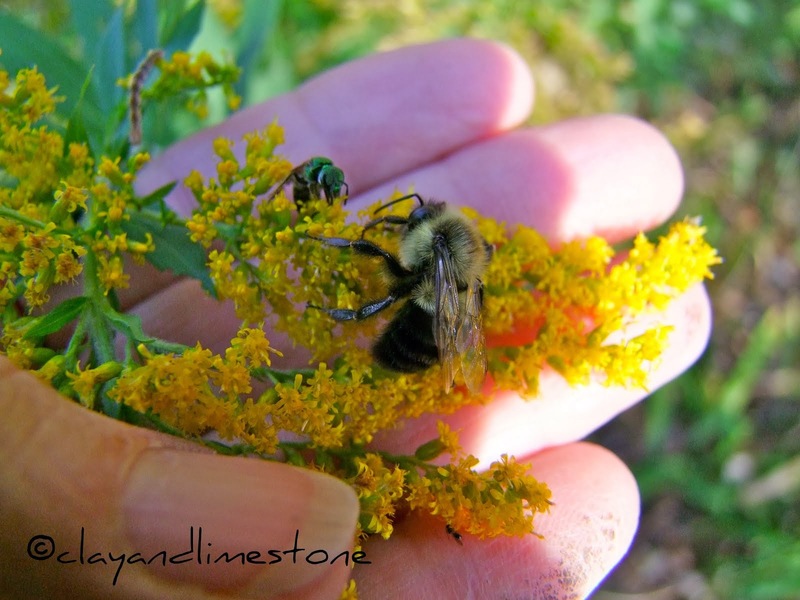 Which brings me to today's Wildflower Wednesday post about thankfulness. I want to thank the best ever group of bloggers who join me on the fourth Wednesday of each month to celebrate wildflowers from all over this great big beautiful world. Diana, Donna, Rose, Sue, Alison, Janet, Kathy, Lea, Carol, Cindy, Ann, Dee, Frances, Hannah, Greggo, Aaron, Jason, Shirley and Beth, you are all the very best. * I am honored that you join me as often as you can. Thank you for caring about wildflowers, for taking the time to share your gardens and your knowledge with all of us. You rock. Happy Wildflower Wednesday to all of you who visit Clay and Limestone. Ps. *I hope I haven't forgotten anyone, please forgive me if I have. 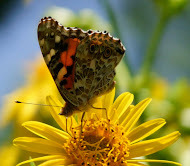 If you are so inclined please join us this month with a wildflower post. Just add your name to Mr Linky so others can read your post. I also have blanket flower blooming through all the frosts and a dusting of snow....and that is the wildflower I am highlighting today. I adore the fall garden of wildflowers now brown and tattered...the seedheads and brown grasses. Your wonderful sentiments about wildflowers echoes in many ways for me too. And most of all I am thankful for you Gail. Without you, I would not know many of the wildflowers or bloggers who are gaga over wildflowers like I am! Wishing you and your family a Happy Thanksgiving!! I found some dandelions and wild violets blooming in the garden this week. Not much else. Have you ever tasted the frost flowers? I would be tempted to if they were in my garden. I always enjoy the oak leaf hydrangeas this time of year. Seems they've held onto those leaves extra long this year too. Happy Thanksgiving Gail! frost flowers - magic made tangible. Almost as if mother nature says thank you to you. (Against the grumbles about rose beetles - ) I bring a portrait of a beetle happily sharing my flowers with me. I enjoyed your post, as always, Gail. It is fun seeing plants we have in common, and enjoy seeing ones that we don't. I hope to get a post up today, but it will depend on how well I use my time. I am thankful to have met you and other garden bloggers as well, even though I am pretty much only posing for WW now that I am spending so much time on FB. Anytime Sue, I will leave it up for awhile. Happy Thanksgiving, and thank you for being a Wildflower lover. Once the temperature doesn't break 50 during the day, my thoughts turn inward, as has the garden. There are a few autumn crocus still blooming and some hellebores, but all the native plants have closed shop for the year. We had snow in October that melted the same day, and snow very recently that didn't. What a wonderful fall you are having. So colorful and frostweed aways amazes me. You reminded me to go out and check mine but despite a freeze nothing has happened yet. I love that oak leaf caught in the Panicum -- living stained glass. Happy Thanksgiving, Gail! Oh those frost flowers just fascinate me! But I'm not much of a morning person, so I'd probably miss them every time they "bloomed"! What a beautiful, beautiful post! I am so fascinated by your frost flowers, Gail! I dont think I've ever seen or even heard of such a thing happening. I'm very partial to wildflowers too. I noticed that in my garden, all the pollinators prefer them to the ornamentals and hybrid varieties. Which makes so much sense! 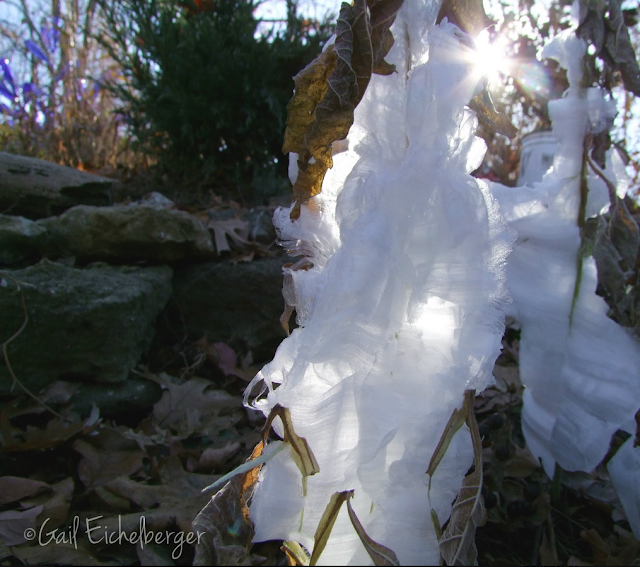 I've never seen frost flowers anywhere but in your garden, Gail--they are just the coolest plant! Blogging has been shifted to a lower priority for me the last six months or so, but I hope to participate in Wildflower Wednesday more often next year. And a big thank-you to you, Gail, for teaching me so much about different wildflowers and for inspiring all of us to recognize the benefits of planting more natives!